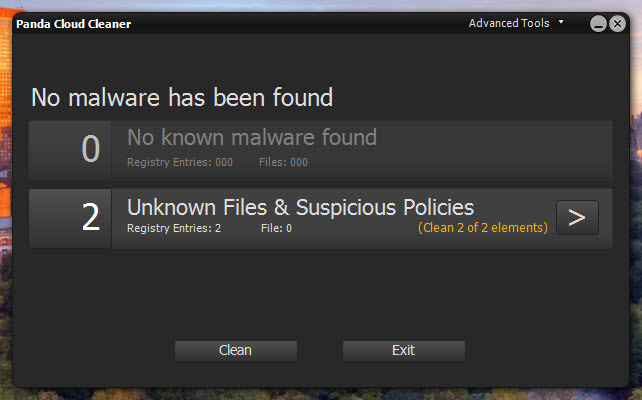 Panda Cloud Cleaner is a free Cloud-based Malware Scanner. Panda Cloud Cleaner is a new, The program is pretty basic and simple enough to use. In the main window, you are presented with one and only button to click, free and lightweight cloud-based malware scanner from Panda Security. The malware removal tool is based on Collective Intelligence that enables you to perform malware scanning in-the-cloud and detect malware that traditional security solutions cannot detect. Hit the “Accept and Scan” button to run the on-demand scanning for malware. Make sure your system is connected to the internet before running the scan. For advanced users, you can take a look at Advanced options. You can tick to activate the trusted boot scan option. It enables the program to scan your system in a special Trusted Boot mode which will closely monitor the PC boot process for hidden malware. Before scanning, the program will first check for latest software updates and download the updates when there is one. The scanning process could take a while to complete. While waiting, you can get other things done first before coming back to see the scan results. After completed scan, Panda Cloud Cleaner will get cleaning instructions from the Cloud to clean up the detected malware. In the scan results, you are presented with the details on the malware found (if any) as well as unknown files & suspicious policies. There is a button to clean up the malware. During our test, there was no known malware found on our system, but just two suspicious registry entries. Panda Cloud Cleaner is compatible with Windows 7 and Vista. Research techniques – Your Favourite DigTech Blog < Loved it!